Zip-UP UnderDeck™ can be painted with a latex paint. All parts are white or beige. White ceiling panels have a serrated finish, beige ceiling panels have a sand pebbled finish. Smooth panels available by special order. ZipUp Orders ship in approximately 10 business days and are shipped via common carrier. 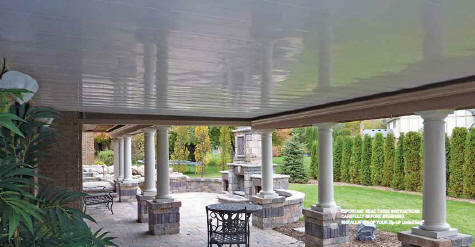 • Zip-UP UnderDeck™ is the best way to finish off your under deck living space. • Installation is simple with only a few common tools. • Zip-UP UnderDeck™ is a water tight water barrier that effectively channels water to a gutter system. • This system provides a flat clean finish that is unparalleled by any other deck finishing system. • No other system offers this much functionality at a low price of around $7.25/sq. ft.
Wall Trim: The "E" shaped trim that attaches around the entire periphery of your deck. Main Rail: The mounting pieces that run the length of your deck. These rails support your Panels. Ceiling Panel: The panels are the ceiling surface that "Zip" into the Main Rails. They are easily removed for cleaning or access to your deck framing. Seam Rail: For decks with runs longer than 16'. ZipUp also makes an indoor ceiling system. Call us for more info. Mounts to the house and the 2 outside rim joists running perpendicular to the house. Mounting Rails that fit into the Wall Trim at the house, supports the Ceiling Panels and attach to the Pitch Rails. You will need one less Main Rail than total number of Ceiling Panels. 1st & Last Ceiling panel edge slips into Wall Trim on one side, and "Zips" into the Main Rail on the other side. All others "Zip" into the Main Rails on each side. To Calculate number needed, divide the width of your deck (in inches) by 12 1/8 (Center to Center of Main Rails) and round up. Used to create slope for the panels from the house to the outer edge of the deck. Use 1/2" for every 4'. EXAMPLE: If the deck runs 12' from the house to the outer edge, you would need 1/2" Pitch rail at 4', a 1" Pitch rail at 8' and a 1 1/2" Pitch rail (a 1" and a 1/2" combined) at 12'. The Pitch rails run perpendicular to and attach to the bottoms of your joist.